WhoDunnit shows are original, lively and thoroughly entertaining, as well as a mystery lover's dream! Clues are cleverly included in the scripted action, and in between scenes (as the audience enjoys a fine meal) the actors mingle with the audience in character, allowing guests to ask questions and get more clues. If you ask them if they are the killer, they will all say no, but that is the only time they are permitted to lie. To all other questions, they must either evade the question or tell you the truth. Audiences love interacting with the characters and trying to figure out whodunnit! Shows are at Masterson's in the beautiful, historic section of Old Louisville. 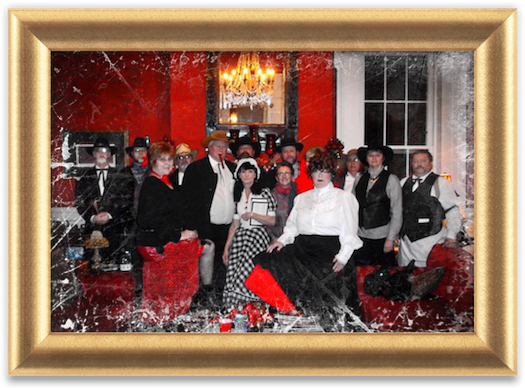 For 30 years, Maple Hill Manor has hosted Murder Mystery Events — an evening of mystery, intrigue, and delicious food — not to mention, GREAT ENTERTAINMENT & FUN! Enjoy a hilarious game, an elegant Gourmet Dinner, and the comforts of a wonderful historic home. Each guest plays a role, lively and hilarious banter occurs throughout the multi-course dinner meal, and a murder takes place by dessert. The objective: figure out who committed the murder and why. Prizes are awarded for best acting, best costume, and SUPER SLEUTH. You'll wonder when you last laughed so much or had so much fun!